SeaStar PRO Outboard Steering systems are suited for all those critical high speed, single powered outboard boats, like Bass, Flats, combo Race/Ski and other performance orientated boats capable of speeds in excess of 65mph. Before ordering it is necessary to determine the proper cylinder and helm pump for your application. See application guide below. All SeaStar PRO systems require the use of a SeaStar PRO helm and SeaStar PRO (1500psi) reinforced Kevlar hoses with All SeaStar PRO systems. Seastar Pro is for high-performance boats with single non-power-assisted outboards up to 350 HP, especially those capable of speeds over 65 MPH, which demand maximum steering control and comfort. It is suitable for use with high-performance propellors and jack plates. • 4.25 turns from lock-to-lock. • Compact helm has only a 4-7/16” footprint – needs only 3” dash hole (tilt requires larger hole). • Optional SeaStar Pro cylinders with longer shaft bushings and even larger pivot bushings for an even more ‘solid feel’. • Factory swaged hoses are Kevlar® reinforced. • Packaged complete with helm, cylinder, fittings, oil, bleeder kit and detailed instructions. • Standard 3/4” tapered steering shaft. • Meets N.M.M.A. certification requirements. • SeaStar Pro is suitable for use with jack plates and performance props. SeaStar PRO Steering systems have the option to install a standard front mounting helm, both classic and sport tilt as well as rear mount helm pumps. 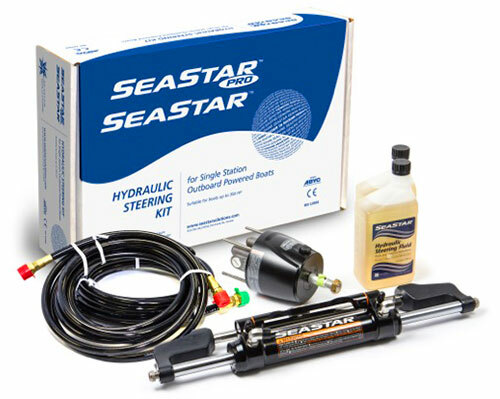 SeaStar Solutions recommends the use of SeaStar PRO (1500 psi) Kevlar steering hoses with SeaStar PRO Helms. Honda 1996-Date 150-300hp HC6345-3 Not available for BF series engines. SeaStar PRO Steering Helms can not be used with an unbalanced steering cylinder. ￼SeaStar Solutions offers SeaStar PRO as complete systems. Every kit ships with the HC6345-3 PRO Steering cylinder, HH5770-3 PRO helm pump, two bottles of SeaStar Steering fluid and two equal lengths of SeaStar PRO, Kevlar steering hoses.